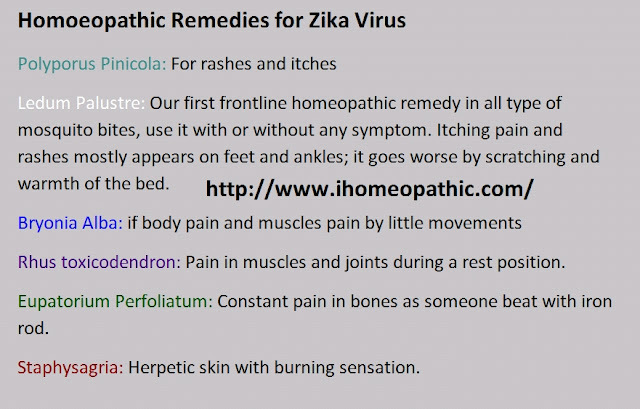 Homeopathic remedies are the best solution for prevention from this Zika virus plus the rapid action of homeopathy could also treat Zika patients in such a short time. This new Zika virus sounds a bit suspicious. It is caused by the release of genetically modified mosquitoes that can insert a vaccine against malaria when they bite you, but that also makes it easier for them to carry and spread the Zika virus which affects mainly people with poor health and pregnant women. An untested experiment? A method of population control in poorer countries and areas? An opportunity for big pharma to create a problem and then reap profits from solving it? First Ebola in Africa and now Zika in South America! Viruses crossing species is a big problem, and, of course, past to the next generation in the womb with every next generation becoming less able. They don't screen for viruses in the vaccines, only look to see if the culture looks healthy. Of course, that particular animal has evolved to deal with the virus so infected cultures can quite often pass their "safety" screening. Zika virus is it deadly? Here we go, watch another fabricated pandemic get created in front of your eyes. I shared another article on this the other day, in that article also, it was described as dangerous primarily because there was no vaccine, NOT because it is a dangerous disease or largely fatal. That doesn't even make any sense. Besides the reason it is dangerous due to no vaccine, all they can say is its mild and in only RARE cases does it cause this birth defect. But look now, they are saying it will spread to all corners of the globe, despite it being around for years and years already. They will spread fear-mongering articles and give this massive traction because the powers that be want it that way even though it is not a threat. They will make it out to be a threat and then voila, they will come up with a vaccine which we all have to take in order to stop the world from dying and the vaccine will have all sorts of dangerous stuff in it which will make everyone ill where everyone was fine before. De-population, big pharma profits! But just watch, they have already made up their minds that this is going to be the next big massive pandemic, watch carefully, this mild virus will be in all the media for weeks and weeks and they will not let it drop until everyone is running scared. They probably picked it because the name sounded weird and will stick in people's heads easily. Everyone is going to be played. Surely the big pharma companies will be rallying governments support to force a Zika vaccine on as many people as possible with all this hype. Don't get me wrong, it's a horrible virus but to Wendy Veena Freeman's point (and this is hardly mentioned anywhere), Brazil introduced genetically modified mosquitoes to the region to combat Zika and looks what's happened. It's spreading like wildfire. Are the GM designed to stop the spread it make it worse so that we can get another revenue stream going for pharma. Too many people have become far too numb to how much is forced upon us for imperfect and limited time 'herd immunity' and not considering some of the tried and tested methods of the past that gave complete and lifelong immunity. it is a proven fact that the bacterium Borrelia (tick borne disease) and other tick-borne diseases were biological weapons at Plum Island after WWII (an island just off the coast of Lyme, Connecticut --thus where this stronger tick-borne disease was 1st found in the form we are fighting now) shows how a disease, which has been around for thousands of years, is now a disease we have no way of fighting well, and curing. It is NOT the same tick-borne disease it was original. That is the problem with Borrelia now "Lyme Disease". What is to stop the powers with the huge money (who create Big Pharma, and research diseases) to continue to research diseases for Profits and for terrifying reasons we cannot comprehend? Then as with Lyme disease, a rush for a vaccine is done for the Zika virus. The vaccine is causing horrid disease and deaths, as with the rushed Lyme vaccine) and now Zika virus. Just are aware people. Don't take a vaccine or give it to your children BEFORE it is completely safe. This so called answer to Zika virus -the vaccine- is causing 100% birth defects in the children of mothers (in Brazil, where it is tested) who were vaccinated with it. As with the Lyme vaccine, it will be PULLED off the market. But so much damage will have been done. Now as to what to do to protect yourself from Zika virus? That is another question. It seems not to be a real threat to healthy people, but mostly to pregnant women’s' unborn children. I am sure more answers will show up in time. Lyme disease is an Epidemic throughout our Nation and the world. But the attention the media will continue to try to play down the devastation of this bacterium and the millions of people (at least 1/2 of a million people per year -- the CDC says about 300,000- of course, that is a safe number to estimate, but also, 100,000's of thousands of cases are NOT reported because they are not diagnosed correctly), who are continuing to contract if from biting insects, now of all kinds, not just the Deer Tick. (Lyme is very expensive to test for correctly, and even extremely expensive to treat - insurance does NOT want to pay for treatment... thus, lots of monies from many sources are fighting in the courts to keep the truth of this situation away from the general public). If you pay attention, you will see MANY people in prominent social levels (celebrities, authors, athletes, and political types and such) coming out telling their own stories about their fights for health, or health of family members, because of acquiring Lyme disease. You can research these people and their fights to survive Lyme disease for yourself. You WILL recognize many of these people! Zika is deemed a concern amongst the fertility folk at work. Concern that the virus lives and can be transmitted through a seminal fluid. They seem to think that even after cryopreservation the virus can survive. The significance of this virus is that it's the only one known to cause birth defects when pregnant women are infected. The governing body is trying to investigate but current advice that if there has been recent travel to the Americas then physical contact is to be avoided for at least six months. The Zika virus is still not confirmed cause and just the best guess, the real cause is still unknown. A new brand of Vaccination was used last year around the same time; Zika is not the confirmed cause of Deformities. 1. If the women's womb can safeguard a child even from HIV, do you think this virus will do the damage? 2. How many doses of vaccine were administered to these pregnant women? Why is that no one is talking about the impact of Vaccination? 3. The Prana's will be very high in women's womb. The vaccines like HPV and others administered before and during pregnancy and the Birth Control pills bring down the prana. As the prana reduces, the body cannot handle the growing needs of the child in the womb and hence disabilities. Fever, rash, joint pain, conjunctivitis muscles pain, and headache and incubation period is likely to be few days to a week. The virus usually remains in the blood of an infected person for about a week or longer. 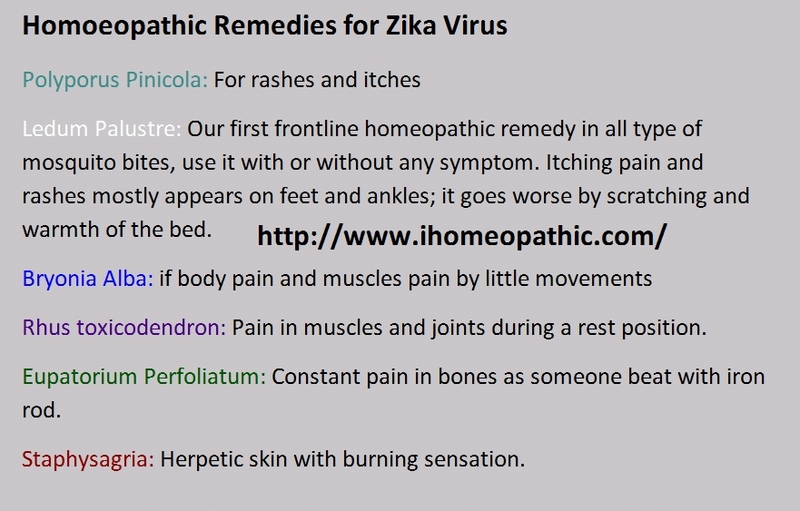 Symptoms similar to those of Dengue and Chikungunya! Get plenty of bed rest and drink fluids to prevent dehydration. Ledum Palustre: Our first frontline homeopathic remedy in all type of mosquito bites, use it with or without any symptom. Itching pain and rashes mostly appear on feet and ankles; it goes worse by scratching and warmth of the bed. Rhus Toxicodendron: Pain in muscles and joints during a rest position. Eupatorium Perfoliatum: Constant pain in bones as someone beat with an iron rod. Staphysagria: Herpetic skin with burning sensation. For Ebola infected patients Lachesis 1m has shown excellent results. Three patients suffering from Ebola infected disease abroad were discharged from the hospital soon after administered of Lachesis 1 M potency. For Conjunctivitis, two doses of Cinaabaris 10 M will completely cure the patients. For Chikungunya Polyporus Pinicola 1m is the best remedy to cure. This I have tried and cured so many patients. Patients affected by Dengue fever Bryonia 200 are the best remedy to cure this fever. The vaccines are more dangerous than the diseases, but they sure will bring out one eventually and make a whole bunch of people sicker than they were going to ever be before. There should be the choice of the healthcare people choose not simply one form of treatment which seeks only to medicate people with expensive pharmaceutical drugs. Homeopathy has shown its worth in the world and will save money both in the short and long term. The microcephaly is from a poison used against insect larvae affecting women in pregnancy. I really do not understand the truth except for Big Pharma wanting to earn money from a new anti-Zika vaccine. Zika is the latest scare tactic by big pharma so they can justify a new vaccine. What happened to Ebola? Zika is a mild virus from a mosquito bite.